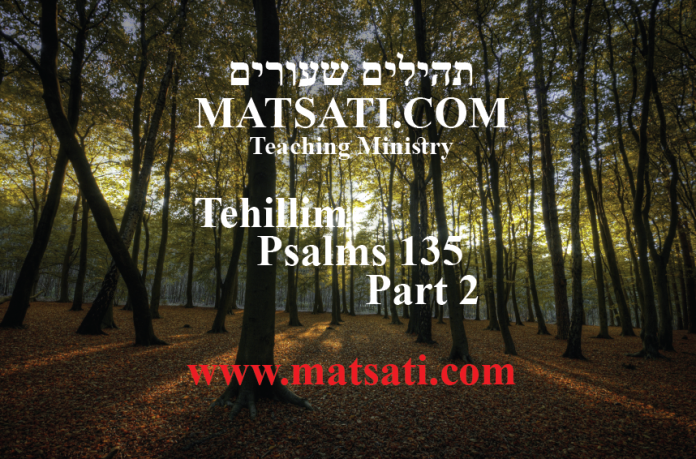 In this week’s study from Tehillim / Psalms 135:1-21, the psalm opens saying, א הַלְלוּיָהּ | הַלְלוּ אֶת-שֵׁם יְהֹוָה הַלְלוּ עַבְדֵי יְהֹוָה: ב שֶׁעֹמְדִים בְּבֵית יְהֹוָה בְּחַצְרוֹת בֵּית אֱלֹהֵינוּ: ג הַלְלוּיָהּ כִּי-טוֹב יְהֹוָה זַמְּרוּ לִשְׁמוֹ כִּי נָעִים: 135:1 Praise the Lord! Praise the name of the Lord; Praise Him, O servants of the Lord, 135:2 You who stand in the house of the Lord, In the courts of the house of our God! 135:3 Praise the Lord, for the Lord is good; Sing praises to His name, for it is lovely. (NASB) The psalmist speaks of the importance of praising the Lord for who he is, Creator, Master, Lord, and the One who loves us beyond words can describe. This is why He showed us the greatness of His love instead. He did so through His redemption. The Lord showed us His love through His Fatherly Compassion. The Lord showed us His love through His Everlasting Lovingkindness. The Lord showed us His love through His Enduring Righteousness. The Lord showed us His love by the way He blesses His people who are faithful. The Lord showed us his love by His Righteous Works. There are many reasons to bring praises to the Lord. Praising the Lord God is what we are called to do first before anything else according to the Psalm. The reasons for praising the Lord are countless. The Lord God is worthy to receive our praise, “For great is the LORD and most worthy of praise; he is to be feared above all gods” (Tehillim / Psalm 96:4), “Great is the LORD and most worthy of praise; his greatness no one can fathom” (Tehillim / Psalm 145:3), “I call to the LORD, who is worthy of praise, and I am saved from my enemies” (2 Samuel 22:4), “You are worthy, our LORD and God, to receive glory and honor and power, for you created all things, and by your will they were created and have their being” (Revelation 4:11). By praising the Lord God in heaven, we are reminded of His greatness! In addition to this, praises are not limited to a verbal acclamation of God’s glory. We can give glory and praise to our God by the use of our physical bodies, and by our deeds. This demonstrates the willingness to serve the Lord by our faith with our hearts, our minds, and our actions. He goes on to speak of how the Lord is the Creator and does as he pleases (135:6), He is in control of natural processes (135:7), He killed the first born of Egypt (135:8), He struck nations (135:10-11), and He gave as an inheritance the land of Israel (135:12). As a result of these things, we speak of the mighty works of the Lord to our children, and therefore His great deeds are remembered through all generations (135:13). The idea is that these gods are worshiped with the hopes they will protect these nations. The mighty works of the Lord, and by His great and powerful Name, the psalmist proclaims has given the land of these people as an inheritance to Israel His people. The Apostle Peter wrote (1 Peter 1:4) the inheritance that we have been given is an inheritance we have been born “into an inheritance that can never perish, spoil or fade. This inheritance is kept in heaven for you.” King David writes, “Lord, you alone are my portion and my cup; you make my lot secure. The boundary lines have fallen for me in pleasant places; surely I have a delightful inheritance” (Tehillim / Psalm 16:5-6). This is why Paul wrote “we fix our eyes not on what is seen, but on what is unseen, since what is seen is temporary, but what is unseen is eternal” (2 Corinthians 4:18). When we understand and value the heavenly glory that awaits us, we are able to endure whatever comes our way in this life. By keeping our eyes upon the Lord, we are able to give God praise even during trials because we have His guarantee that we will receive all He has promised, i.e. “For our light and momentary troubles are achieving for us an eternal glory that far outweighs them all” (2 Corinthians 4:17). The psalmist states יד כִּי-יָדִין יְהֹוָה עַמּוֹ וְעַל-עֲבָדָיו יִתְנֶחָם: טו עֲצַבֵּי הַגּוֹיִם כֶּסֶף וְזָהָב מַעֲשֵֹה יְדֵי אָדָם: טז פֶּה-לָהֶם וְלֹא יְדַבֵּרוּ עֵינַיִם לָהֶם וְלֹא יִרְאוּ: 135:14 For the Lord will judge His people And will have compassion on His servants. 135:15 The idols of the nations are but silver and gold, The work of man’s hands. 135:16 They have mouths, but they do not speak; They have eyes, but they do not see; 135:17 They have ears, but they do not hear, Nor is there any breath at all in their mouths. 135:18 Those who make them will be like them, Yes, everyone who trusts in them. (NASB) The psalmist’s statement that “the Lord will judge His people” in the light of modern theologies, do Christians believe God will judge His own people? The author of the book of Hebrews wrote “For we know Him who said, 10:30 “VENGEANCE IS MINE, I WILL REPAY.” And again, ‘THE LORD WILL JUDGE HIS PEOPLE.’” These Scriptural quotes are lifted from the song of Moshe in Devarim / Deuteronomy 32:35-36 which states, “Vengeance is Mine, and retribution, in due time their foot will slip; for the day of their calamity is near, and the impending things are hastening upon them. For the LORD will vindicate His people…” (NASB) The book of Devarim / Deuteronomy speaks about obedience being essential in the life of God’s people. At the time of the writing of the song of Moshe we find the people consisting of the second generation of the Israelites who came out of Egypt. The stipulation that was given to the people, they were to not only take the land and remain in it, they also needed to remain faithful as well. In Devarim / Deuteronomy 32, the LORD through Moshe predicts the future fate of physical Israel as well as their enemies. The Lord first recounts His faithfulness to His people (32:1-14). He continues saying Israel would grow fat (32:15), forgetful, and forsake their Rock (32:18). The Lord will have patience and wait for her repentance, but when the people become unrepentant and unfaithful, when His lovingkindness and mercy has been exhausted, He promised He would send the armies of Israel’s enemies, the Gentiles to judge the nation (32:25-26). The Lord God of Israel however would put limits to the destruction that is brought at the hands of the Gentiles so that they wouldn’t think they had done this to Israel by their own power. The purpose of this is to preserve the faithful remnant of the people of Israel (32:27). Moshe then speaks of Israel not learning the lesson from God’s judgments at the hands of the nations. They are not able to understand the end of their sinful behavior (32:28-29). The very fact that the nations have the ability to come down upon them with the Lord God protecting them demonstrates their sinful actions, their idolatry has caused God to lift his protective hand from them. (32:30-33). The people of Israel were set apart, sanctified by the commandments. This is repeated today in the daily prayers. Judgment befell the people who grew fat, forgetful, and who forsook the mercy and grace (lovingkindness) of God. The people essentially trampled under foot the blood of the covenant insulting the spirit of grace that God had given. In a similar manner, today, in the covenant by the blood of the Messiah, we have to be careful not to be fat in spiritual things that leads to forsaking and forgetting our Rock, our Lord, and our God. Yeshua the Messiah offered His blood for the purpose of saving us from sin, not so that we might sin again (or more). Yeshua’s blood was not shed in order to allow us t o continue in sin that grace might increase (Romans 6:1). This is insulting the spirit of grace that the author of the book of Hebrews writes about. These things are important because they have bearing upon our eternal life. This is why the author of the Psalms wrote, 135:15 The idols of the nations are but silver and gold, The work of man’s hands. 135:16 They have mouths, but they do not speak; They have eyes, but they do not see; 135:17 They have ears, but they do not hear, Nor is there any breath at all in their mouths. 135:18 Those who make them will be like them, Yes, everyone who trusts in them. (NASB) Sin has the tendency to make us after its image because of the intimate nature of sin being found in the deeper recesses of the heart. The thing that we truly believe comes forth and is manifest in our lives. This is why Yeshua said in Matthew 7, by their fruit you will know them. The Psalm concludes saying, יז אָזְנַיִם לָהֶם וְלֹא יַאֲזִינוּ אַף אֵין-יֶשׁ-רוּחַ בְּפִיהֶם: יח כְּמוֹהֶם יִהְיוּ עֹשֵֹיהֶם כֹּל אֲשֶׁר-בֹּטֵחַ בָּהֶם: יט בֵּית יִשְֹרָאֵל בָּרֲכוּ אֶת-יְהֹוָה בֵּית אַהֲרֹן בָּרֲכוּ אֶת-יְהֹוָה: כ בֵּית הַלֵּוִי בָּרֲכוּ אֶת-יְהֹוָה יִרְאֵי יְהֹוָה בָּרֲכוּ אֶת-יְהֹוָה: כא בָּרוּךְ יְהֹוָה | מִצִּיּוֹן שֹׁכֵן יְרוּשָׁלָם הַלְלוּיָהּ: 135:19 O house of Israel, bless the Lord; O house of Aaron, bless the Lord; 135:20 O house of Levi, bless the Lord; You who revere the Lord, bless the Lord. 135:21 Blessed be the Lord from Zion, Who dwells in Jerusalem. Praise the Lord! (NASB) What does it mean to bless the Lord? The Psalmist at the end of Tehillim / Psalms 135 is overwhelmingly focused on blessing the Lord. There are multiple ways that one may bless the Lord. One is to speak well of His greatness and goodness and really mean it from the depths of the soul. What David is doing when calling upon Israel, the house of Aaron, the house of Levi, and all those who revere the Lord to bless the Lord He is saying that we are to speak of God’s goodness from the inner deepest recesses of the heart. Now blessing the Lord with the mouth only is called hypocrisy. Yeshua said in Matthew 15:8 “This people honors me with their lips, but their heart is far from me” quoting from Isaiah 29:13. As God’s people we are called to righteousness, holiness, justice, and truth. These things are found within the commandments of God, and the covenant we have in Yeshua the Messiah, the Lord sends His Holy Spirit to dwell within our hearts empowering us to overcome sin which has its end goal of obeying the commandments. A popular response today in this post-modern culture is, “The commandments are of little or no value in our society where people think everything is relative. There are no absolutes for all situations.” It is also amazing to hear someone say, “Stealing and lying are not always wrong if these acts benefit a good cause.” Or another one I have heard people say, “Unfaithfulness in marriage might not always be wrong if the relationship between the husband and wife is already gone,” etc. These are the kinds of reasoning that people use to justify their sins. This is the conviction of millions of people in our society today which leads to a very confused society. I have heard these types of responses come from Christians as well as the confused idea that obedience to the commandments makes one Jewish, or causes one to pretend to be Jewish, or that the Lord never intended for the gentile believers to be Jewish, etc under the assumption that obedience to the commandments was only given to Israel and not the rest of the world. This clearly is not based in the Scriptures (e.g. Isaiah 1-2). This misunderstanding has led to a majority belief that all one has to do is hold fast to the golden rule, “do unto others as you would have them do unto you.” (Matthew 7:12) The basis for this is found John 3:16, “For God so loved the world that he gave his one and only Son, that whosoever believes in him will not perish but have eternal life.” The point is, the relationship between God and his people would always be built on faith and obedience to the Torah (faithfulness). To state otherwise is inconsistent with what we find written in Scripture. The reason this is so is because faith is always spoken of within the context of faithfulness in the Bible. The best way we can be a blessing to the Lord God in heaven is to walk in faithfulness to Him day by day. Let’s Pray! The Rabbinic Commentary (Midrash) on Tehillim / Psalms 135 has 2 parts. Reading through the Midrash we will be looking at Part 1, 2, 3, and 4. Let’s begin by outlining Midrash Tehillim Chapter 135, Part 1 and 2. The משל (mashal) “the parable,” goes on to explain the פתיחתא (Petihta), the rabbis parallel the clouds to the one who comes with the clouds, the Lord God Almighty. The נמשל (Nimshal) “expansion on the parable” expands upon the משל (mashal), the rabbis differ saying the vapors come from below and not above. The משל (mashal) “the parable,” goes on to explain the פתיחתא (Petihta), the rabbis parallel the vapor to five things. The נמשל (Nimshal) “expansion on the parable” expands upon the משל (mashal), explaining how each of these five things are related. א הללויה הללו את שם ה׳ וגו׳, מעלה נשיאים מקצה הארץ. ריש לקיש ור׳ יוחנן, רבי יוחנן אומר אין עננים אלא למעלה, שנאמר וארו עם ענני שמיא (דניאל ז יג), ריש לקיש אמר אין עננים אלא מלמטן, שנאמר מעלה נשיאים מקצה הארץ, על דעתיה דרבי יוחנן לאחד שכבד את חבירו בחבית של יין וקנקנה עמה. ודעתיה דריש לקיש לאחד שאמר לחברו הלויני סאה של חטין, וא״ל הביא קופתך, כך אמר הקב״ה לארץ אייתי עננך וקבלי מטר. 1. The Lord is great He causes the vapors to ascend from the ends of the earth (Tehillim / Psalms 135:5,7). Concerning this verse, Resh Lakish and Rabbi Johanan differed, Cloud vapors, said Rabbi Johanan, come only from above, for it is said I saw in the night visions, and behold, there came with the clouds of heaven one like unto a son of man (Daniel 7:13). But Resh Lakish said that cloud vapors come only from below, for it is said He causes the vapors to ascend from the ends of the earth. Rabbi Johanan’s view is that God’s giving of the vapors is like a man’s giving a bottle of wine in its container to his friend. Resh Lakish’s view is that as a man says to his friend, Lend me a measure of wheat, whereupon his friend declares, bring me your basket, so the Holy One blessed be He, declares to the earth, Bring Me your cloud vapor, and you will receive rain. מקצה הארץ, “He makes the clouds rise from the end of the earth.” The clouds of glory were contributed by G’d Himself (descending to Moses’ tent), completing all that was needed to make the Tabernacle operational. This commentary states the clouds of glory were attributed to the Lord God Almighty Himself. He says the clouds descended and did not ascend per what Rabbi Resh Lakish is saying in Midrash Tehillim. The glory of God descends upon mankind and not the other way around. Here in Midrash Tanchuma, the rabbis describe clothing as the clouds of glory that encircled Sarah’s tent. The basic concept here is the glory of God has been given to God’s people via the commandments. The glory of God is found within His righteousness, holiness, justice, and truth. The Lord commanded His people to the same, we are called to encircle out lives with the clouds of glory, the Torah (instructions) of God. Revelation 19 speaks of the people of God being clothed in white robes which is paralleled to the righteous deeds of the people. The commands of God are a very important aspect in the lives of God’s people. Rambam speaks of having faith and having a simple belief in the existence of God. He says just having faith in the existence of God or of His majesty and glory do not constitute the fulfillment of the commandment “and you shall love the Lord your God.” Loving God involves actually doing something and not just about changing our minds or thinking in a particular way. The biblical descriptions of faith is not simply about just believing in God and His Messiah. This is why our relationship with the Lord God is always paralleled to that of a marriage covenant between a husband and wife. The true test of faith is found in the way in which we treat our family and friends. Faith is connected to faithfulness, the putting of our faith into action. This is paralleled to what is written in the commentary Sefer HaChinukh 292:2. The glory of the [Temple] is from the roots of the commandment; and as I wrote in the negative commandment that a blemish not be placed on consecrated animals, in this Order (Sefer HaChinukh 287). The rabbis say the glory of the Temple is from the roots of the commandment. This is paralleled also to what Paul wrote in 1 Corinthians 3:9-23. Note that salvation is not based upon the deeds, but upon the Lord God who moves in the heart of the one who obeys His commandments. This illustrates for us how the Lord has pulled us out of our former lifestyle, and cleansed us and set us apart for righteousness. Paul also wrote elsewhere (Romans 12:2) that we have been set apart as holy, set apart from this world for godliness. It is our faith in the Messiah that begins this pursuit of holiness in our lives to walk in God’s ways. The Lord God Almighty, our Father in heaven, sets us in a state of holiness in His Son Yeshua the Messiah, and then we are put upon the path of practical holiness something of which we must actively pursue. The Lord expects us to cultivate a lifestyle of holiness (1 Peter 1:14-16) and commands us to “cleanse ourselves of all defilement of flesh and spirit, perfecting holiness in the fear of God.” (2 Corinthians 7:1) What Paul is saying about bringing holiness to “perfection” means that we should be increasing in spiritual fruitfulness every day. We consider ourselves dead to sin (Romans 6:11), and refuse to turn back to our former lifestyles. We take the commandments of God and apply them to our lives and it is in this way we “cleanse ourselves from what is dishonorable,” becoming vessels for “honorable use, set apart as holy, useful to the master for every good work.” (see 2 Timothy 2:21) Holiness is the mark of every true believer (see 1 John 3:9-10). Midrash Tehillim 135 Part 1 concludes saying, “Resh Lakish’s view is that as a man says to his friend, Lend me a measure of wheat, whereupon his friend declares, bring me your basket, so the Holy One blessed be He, declares to the earth, Bring Me your cloud vapor, and you will receive rain.” The parallel here is to the man who needs a measure of wheat. He goes to his friend and asks, and his friend asks him to bring a basket. This represents the one who seeks must do something in order to receive. This represents the commandments, though we fail we are trying and striving for the righteousness of God in pursuit of His holiness. The rabbinic response is that “the Holy One blessed be He speaks to the earth to bring your cloud and you will receive rain.” In the midrash, the cloud represents the glory of God which is found in His commandments. ב חמשה שמות יש לו, עב ענן איד נשיא חזיז, עב שהוא מעבב את פני הרקיע. איד שהוא שובר בעלי שערים. ענן שהוא עושה את הבריות ענוים אלו על אלו. נשיאים שהוא עושה הבריות נשיאים אלו על אלו. הזיז שהוא עושה חזיונות ברקיע ומשרה רוח הקדש על הבריות, כמד״א חזון ישעיהו (ישעיה א א). 2. The cloud vapor is called by five names, darkener, maker of meekness, discomfiter, maker of princes, and maker of visions. It is called darkener, because it darkens the face of the firmament; discomfiter, because it discomfits speculators; maker of meekness, because it makes men meek toward one another; maker of princes, because it makes men act in a princely manner toward one another; maker of visions, because it makes visions appear in he sky, and also makes the vision of the Holy Spirit rest upon men, as is said, The vision of Isaiah (Isaiah 1:1). The rabbis say the cloud is called “darkener, because it darkens the face of the firmament; discomfiter, because it discomfits speculators; maker of meekness, because it makes men meek toward one another; maker of princes, because it makes men act in a princely manner toward one another; maker of visions, because it makes visions appear in he sky, and also makes the vision of the Holy Spirit rest upon men, as is said, The vision of Isaiah (Isaiah 1:1).” The cloud represents the glory of God which is said to do all of these things. The point appears to be the humbling of man before God through His power and His glory. Paul wrote “Work out your own salvation with fear and trembling, for it is God who works in you, both to will and to work for his good pleasure.” (Philippians 2:12-13) Here we see cooperation between God and His people in the sanctification process. We “work out” what the Lord God “works in us,” because the Lord has a time-line for what He plans to cultivate in our lives. Our responsibility is to yield to His plan and working out with focused attention and great care those things that He is causing to grow in us. Holiness will not be brought to completion in our lives with no effort on our part. We are told the Lord will carry us on eagles wings (Shemot / Exodus 19:4). Though we are told this, we will not be carried to the skies on flowery beds of ease. The hard choices come by the leading of the Spirit of God (Galatians 5:16-18) and making the decision to obey His commandments. The flesh is weak (Mark 14:38) and so we will not reach sinless perfection in the olam hazeh, but the Lord God has made provision for our sin. “If we confess our sins, he is faithful and just and will forgive us our sins and purify us from all unrighteousness.” (1 John 1:9). The Lord God helps us in our weakness by giving us His Holy Spirit who speaks to us to be mindful of holiness, righteousness, justice, and truth which enables us to carry out His will on earth (1 Corinthians 2:14-16, Philippians 2:13). When we yield our lives to the Spirit, we begin to produce fruit yielding a harvest with which God is well pleased (Galatians 5:22-23). These things as they are related to the commands of God are that we are to offer our lives back to the Lord who has redeemed us. We surrender our lives to God’s ways in righteousness and holiness because this is to our benefit (see Devarim / Deuteronomy 10:13). Because of God’s mercies we have the opportunity to offer our bodies as living sacrifices, holy and pleasing to the Lord (Romans 12:1). Midrash Tehillim 135 Part 2 concludes saying, “maker of princes, because it makes men act in a princely manner toward one another; maker of visions, because it makes visions appear in he sky, and also makes the vision of the Holy Spirit rest upon men, as is said, The vision of Isaiah (Isaiah 1:1).” Note how the Lord causes His Spirit to rest upon men. This has the effect of making men to act in a princely manner towards one another. The princely state involves status, size, and wealth. If we consider the one whom we serve and the place in which He establishes us making us to be kings and priests (Revelation 1:6), the Lord has given us status, size, and great wealth. The word prince denotes a military leader or commander, where in Hebrews 2:10 Yeshua is said to be made the captain of our salvation who was perfected through sufferings. As a captain or commander, he leads us in the way of righteousness, holiness, justice, and truth. Yeshua is called the prince of life, he was not the one who destroyed life but gives life abundantly to those who ask. Yeshua our Lord is the giver of eternal life (John 10:28), we are told in Him was and is life in its fullest and in the widest sense, physical, intellectual, moral, and spiritual. He takes our world and turns it upside down discomfiting what is deeply rooted in our hearts. He makes us to be princes, to be meek, and this title which was given to the Messiah where “the Lord God had glorified his Servant Yeshua,” the Lord also does this to us His servants for His glory and so we will bear His testimonies according to His commandments. Let’s Pray!